Yesterday I saw a bird sitting in my blueberry tree…I lost it. I’m not willing to share them with a bird. It was even a blue bird, how ironic is that? 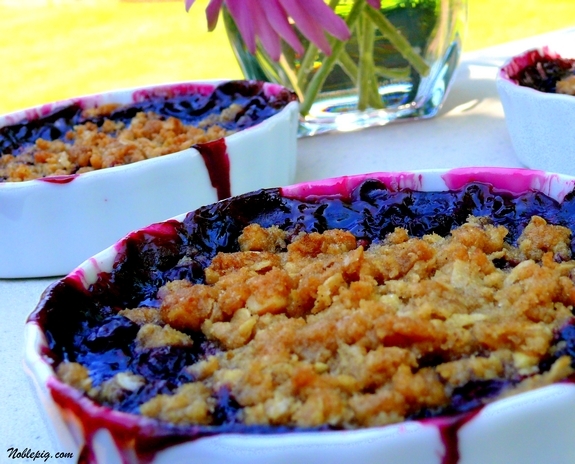 I love a good berry crisp for dessert, it’s a great summertime staple and the fruit choices are endless. I think I prefer a crisp to a cobbler because I like the crunch factor. I think I’ve made everything sweet I possibly can with blueberries. I think I might venture to the savory route now with sauce reductions for pork or chicken. I just read a blueberry bush can produce 6,000 berries in one year. And just think, I have two blueberry trees. That’s a lot of berries. I’m well on my way. Let’s whip this up shall we…. In a medium bowl combine 6 Tablespoons sugar, 6 Tablespoons flour, 1/4 cup rolled olds, 1/4 cup light brown sugar, 1/4 cup chopped walnuts, 1 teaspoon lemon zest, 1/4 teaspoon vanilla, 1/4 teaspoon kosher salt and 1/4 teaspoon ground cinnamon. 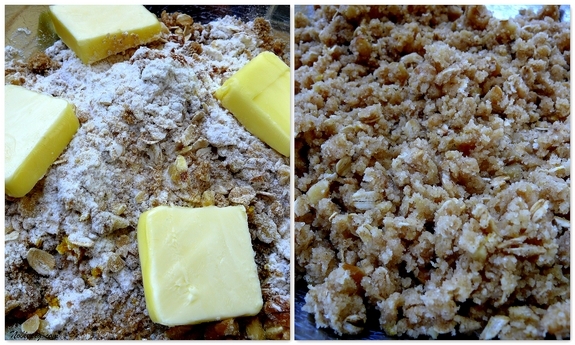 Using your fingers, work 4 Tablespoons unsalted butter into the flour mixture until crumbly. Transfer the topping into the freezer to let chill for 30 minutes. In a large bowl, stir together remaining sugar and salt, 2 teaspoons lemon juice and remaining vanilla, along with 4 cups blueberries, 2 Tablespoons cornstarch and 2 teaspoons of brandy. Place 4 six-ounce fluted ceramic ramekins on a parchment paper-lined baking sheet. Divide berry mixture between the ramekins. Mound some of the topping over each ramekin. Bake in a 350 degree oven until the berries are bubbly and the topping is browned; about 35-40 minutes (mine only took 25). Don’t forget the ice cream on top. I have to say, I make a very good blueberry pie, but I personally prefer blueberry crisp. With fresh from the bush blueberries, you can’t go wrong. Just make sure there is plenty of REAL whipping cream or vanilla ice cream. You always make my mouth water. If you can get some peaches I made some blueberry peach preserves that are so yummy. If you think you are this excited about blueberries wait until your grapes start growing! Looks yummy! I am envious your blueberry bushes. I prefer the crispy crunch as well. These are simple and wonderful! Thanks for sharing. Off to check out the other recipe, so thanks for that as well. GORGEOUS! They look so so yummy. I love the topping. Yum. I have been in a blueberry baking mode. Picked 16 pounds of them last week, so blueberries will be on the menu for a bit! Such tantalizing photos! With the grand finale of gently melting ice cream topping. My mouth is watering! My father would have proposed to you had he been able to see this recipe…he too, loved a crisp as opposed to a cobbler…and yes, never forget the cream on top! I prefer a crisp too because of the crunch. Love that texture with baked fruit. Looks like a very versatile topping for peaches too. And the ice cream is a must have. Is it possible to fall in love with a dessert? If so, I’m guilty of it. Looks awesome! 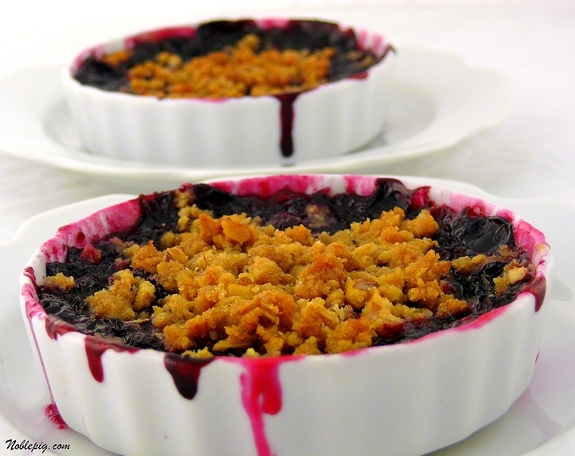 Loving your blueberry recipes! This is another must try! Beautiful! 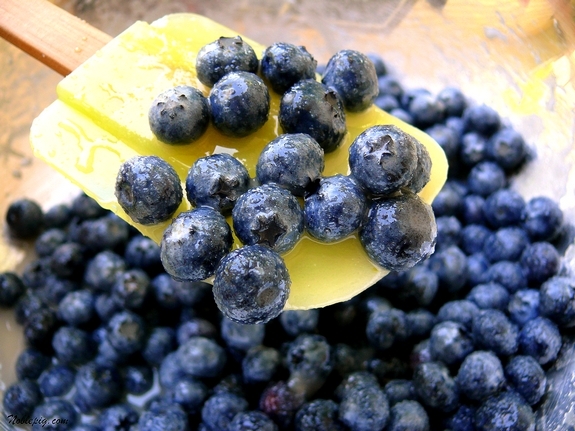 Made the blueberry ice cream yesterday – delicious. I was going to make a peach cobbler today. Colorado has no blueberries, but does have some wonderful peaches. The cobler has just turned into a crisp. Thanks for all the delicious ideas. So..um, what did you do to the poor birdie? 🙂 These look amazing! Looks scrumptious as usual. Yeah, birds love those berries. At our support group meeting the other night, one person had added blueberries to the green salad she brought. It went very quickly. 🙂 On vacation I had a simple, but elegant dessert of three dollops of different homemade ice creams and at the bottom of each dollop was different fresh fruit. Blueberries were under the hazelnut dollop! Oh, I’m jealous! With the ice cream, it look so delicious! I love a good crisp. I never thought of putting the crisp in the freezer before baking…duh, what a great idea. That’ll make it more crisp. I’ve made a few lately that weren’t crisp enough and was thinking of how to increase that crunch factor. Thanks! Now if only I could have blueberry bushes in my backyard! It sounds scrumptious. I was born in Maine where blueberries go on for miles. Cinnamon is good with blueberries but nutmeg is better, many an old blueberry recipe will call for nutmeg. My mother-in-law prefers cardamom in the blueberry cake she makes,also good. I’ll stick with nutmeg though for that blueberry bliss. They look really delicious Cathy, I love blueberry! I love the little ramekins! Blueberries are so wonderfully versatile. Your crisp looks so yummy! I could eat it for breakfast! Wow, the color is so inviting. I like the idea of walnuts and brandy in here! Very beautiful photographs as usual. Oh wow, I’m swooning over this! Beautiful! Wow–another good looking blueberry treat! My little blueberry plants aren’t looking too good–I hope they make it!! I am a huge fan of the crumbles and cobblers! I just picked up loads of berries at the market – for dirt cheap – and can’t wait to get a few of these in the oven. I will be freezing many more pounds of berries to enjoy during the winter. this is ALMOST as beautiful as that ice cream, and just as decadent. thank heavens for blueberries! That looks amazing. I love blueberry crisp. My grandfather had a bunch of blueberry bushes. He always draped rubber snakes in the branches to keep the birds away. I don’t know if it worked or not but thought I would throw it out there. I’m still jealous of your blueberries. Beautiful color and oh how I wished I had them growing wild. I’ll be making these soon. We have been eating tons of blueberries lately. I’m sure they’ll be hit. I wasn’t planning on sharing mine either, but I got barely a handful and the birds got the rest. When I was a kid, mom made me go out and tie tinfoil on all the branches of the blueberry and huckleberry bushes to keep the birds away. That’s what kids are for I guess. That looks so good. 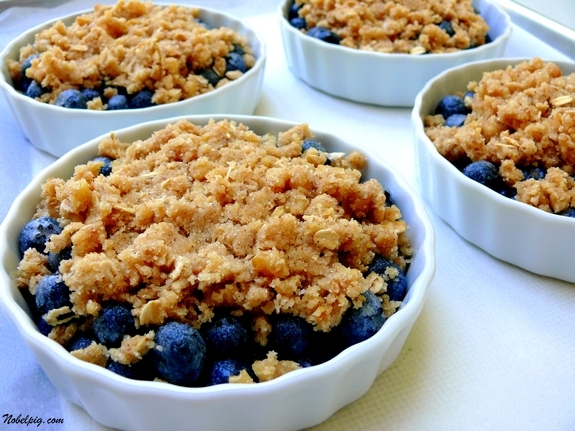 I am going to have to try this out, I have used your blueberry crumble from last year so many times. I love these gorgeous individual blueberry crisps – yum!!! The birds love our bushes too. But, I also planted many extra bushes to ensure I would get as many as I cared to pick. Your crisps are gorgeous! Great color. Are you planning to make any jam? A friend makes a delicious blueberry-basil jam that’s so good with goat cheese or brie. That looks to die for….so yummy! I love blueberries!!!!! I may just have to make this… my mouth is watering. Your look great! They were really good, weren’t they? I’m making this, today! I’ve got to start using up all these blueberries! I’m with you…..I like the crunch factor. I love the color! I’m on way to the market for more berries. I think I’ll try these. Your recipe is great. 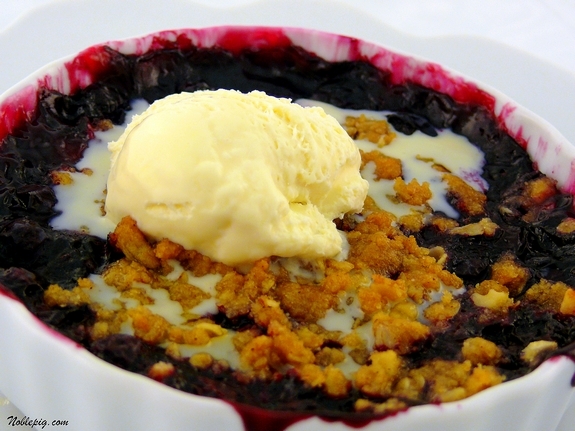 Just took the blueberry crisp out of the oven and it’s the best recipe I have come across. I didn’t have brandy so I used Grand Marnier and I didn’t have the individual ramekins so I put into a quiche size “ramekin”. Thanks for sharing your recipes and the great photography. Those pictures are stunning! 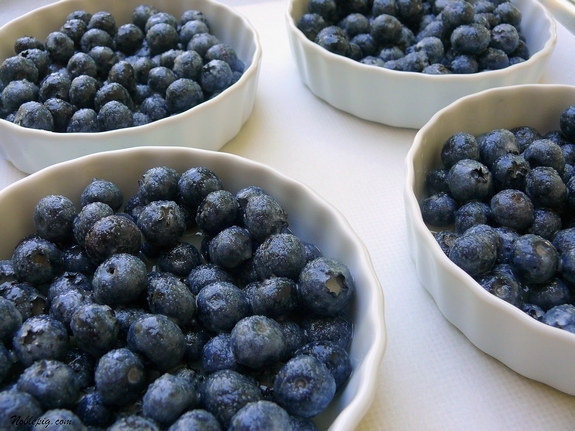 Glad you found something wonderful to do with all your blueberries. 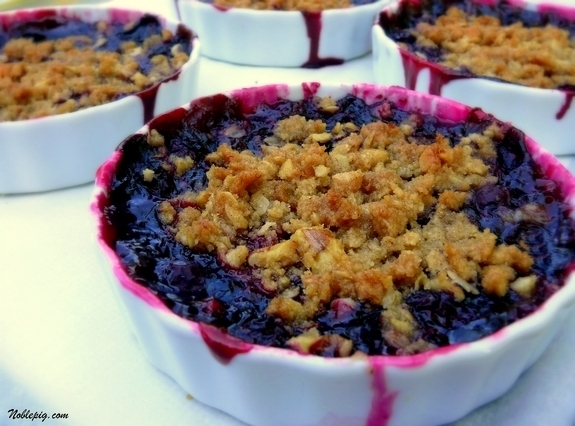 I recently saw another blueberry crisp recipe and have been thinking about making it since. Now, here’s another one — it’s a sign!